If your classic beauty has broken down, you might be on the look-out for classic car repair in Covina. Johnny’s Auto Service can help you get back on the road in no time. We are an AAA-Approved shop for California auto lovers. With a clean garage filled with state-of-the-art bays, we have all the equipment and expertise necessary to repair your classic vehicle. It can be difficult to find the right classic car repair shop for your foreign or domestic car. Whether you drive a classic car or a modern vehicle, we are happy to help. We have access to all the right parts for your vehicle, and auto technicians who are trained in repairing these cars, as well as a variety of domestic vehicles. Have you been searching for the right mechanic for your Cadillac, Lincoln, or Oldsmobile? We have experience with these vehicles as well! 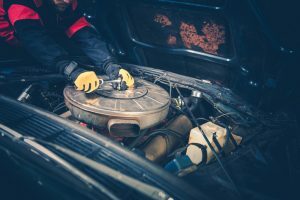 Our classic car repair offers anything an auto lover might need, from carburetor rebuilds to updates to your vehicle’s braking or electrical system. Your car might be vintage, but there’s no need to compromise on safety or efficiency. Visit Johnny’s Auto Service today to learn more about how we can upgrade and repair your vehicle, inside and out. Of course, we don’t just offer classic car auto repair. Whether you’re a car collector or need repairs on your primary vehicle, Johnny’s offers it all. We are an ASE Blue Seal of Excellence Auto Repair Shop, which means that you can count on our shop for high-quality work. All of our technicians are ASE Certified and dedicated to providing the highest standard of service. We’re so confident about the work we do that we offer a 2-year, 24,000-mile warranty on all repairs. Our auto technicians are led by co-owner Byron Moreira, who has over 40 years of experience repairing all brands of vehicles. So bring yours in today. We even offer a convenient drop-off box. For classic car repair in Covina, check us out today. You can reach us by phone at (626) 966-5212.